The Hmong textile art of paj ntaub, literally translated as “flower cloth,” is rooted in centuries of tradition. Customarily used to decorate jackets, headdresses, skirts and baby carriers, these crafts identified which group of Hmong a person was from. The most well-known technique of paj ntaub is reverse appliqué. It consists of intricate, symmetrical designs cut from folded pieces of cloth, similar to snowflakes made from paper, and hand sewn onto a background fabric. 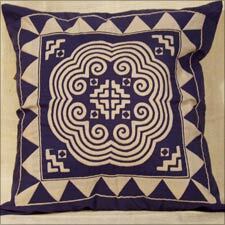 Other Hmong textile arts include cross stitch, lifescenes, and batik. CAMACrafts products showcase the traditional patterns of various Hmong villages and groups, maintaining their intricate designs and originality. Products are colorfast and machine washable unless otherwise indicated.